THURSDAY, 11.20AM: THE management of a suspicious bushfire east of Grafton has been hailed a success, with firefighters bringing it under control quickly despite its size and challenging conditions. 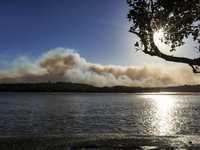 First reported on Sunday, the Fannings Trail fire in Yuraygir National Park was raging for three days before being contained, due to a coordinated effort between the National Parks and Wildlife Service, Rural Fire Service volunteers and Forestry Department. NSW National Parks and Wildlife Service Clarence South Area manager Andrew Lugg commended the "great team effort" it took to make it happen. "Despite some very difficult conditions they've probably kept it from being a lot bigger, " he said. "It could have been much bigger judging by historical events - 12 years ago in the same area and similar conditions we had a fire that grew to about 20,000 hectares. "I think that's a result of improvements in fire management, better use of aircraft and better co-operation between agencies, and probably more strategic use of backburning too as a control measure." Mr Lugg added that while the worst of it was over, authorities would have to be very vigilant through ground and air monitoring to make sure the blaze of about 3500 hectares doesn't get a second wind. Today's high temperatures are expected to add to the challenge. "The containment lines held very well overnight, so now it's just about making sure there are no flares ups or ignitions on the wrong side of the lines," he said. "The fire's burning itself out now but still there are smouldering logs and pockets of fire." UPDATE, 12.30PM: THE last frontiers of a back-burning operation to contain a highly suspicious fire burning through the Yuraygir National Park are being worked on by scores of firefighters. 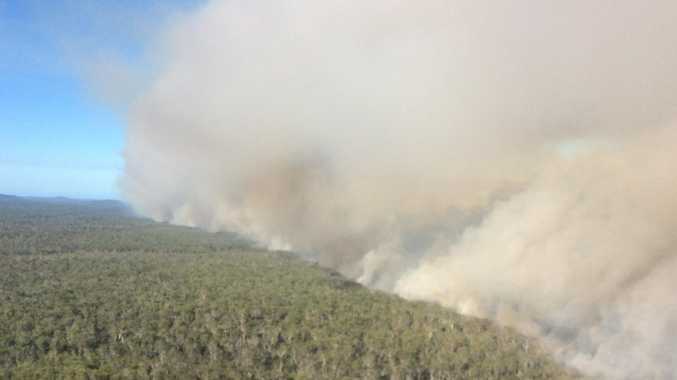 NSW National Parks and Wildlife Service (NPWS) Clarence South Area manager Andrew Lugg said the main focus of today was to fill the gaps in containment lines on the western side of the blaze. If all goes well, the fire status will be changed to 'under control' by the end of the day. "Once that's done the whole fire ground will be contained, so from there focus is mopping and patrolling," he said. "Although it's been a large fire, growing daily, the growth in the last day has been largely due to us infilling or back-burning. "We're working to a big picture strategy of containment by introducing fire to the boundaries." According to the Rural Fire Service's Fires Near Me website it has now burnt through more than 3110 hectares of bush and scrub. Mr Lugg said that while people will still see plenty of smoke around, it should drop away today or tomorrow. Precautionary measures taken to ensure the safety of campers are expected to be relaxed tomorrow too, with Sandon campgrounds expected to reopen. The Illaroo campground will remain closed for now. Investigators are also expected to move in to the area today to delve into the cause of the blaze, which appears to have multiple ignition points and has been described as 'highly suspicious' due to the location, time of day and absence of lightning. WEDNESDAY 9.15AM: FIRE authorities are hoping improved weather conditions today will help them bring under control a fire raging through Yuraygir National Park near Sandon. A spokesman for the NSW Rural Fire Service, which is assisting the NSW National Parks and Wildlife Service, said up to 75 firefighters and water-bombing aircraft were now working around the clock to contain the blaze, which has burnt through more than 3110ha of bushland. "The current status of the fire is that it's being controlled so we're getting closer to containment," the spokesman said. "Temperatures are down and the fire risk is a little lower, but there is a lot of smoke still being generated by this fire so we do ask residents to only report unattended fires." There have been no evacuations as yet, but yesterday morning protection zones were set up around Minnie Village and Illaroo campgrounds, with campers advised to leave the area due to the potential for the fire to spot across the Sandon River. "We strongly suggest residents have a bushfire survival plan made or updated, and for that we direct people to myfireplan.com.au," the spokesman said. Visit www.rfs.nsw.gov.au or call 1800 NSW RFS for the latest updates. If you need to report a new fire or require urgent assistance, dial Triple Zero (000). UPDATE, 3.30PM: Firefighters are preparing to work through the night to continue containing a bushfire in national park to the east of Grafton. 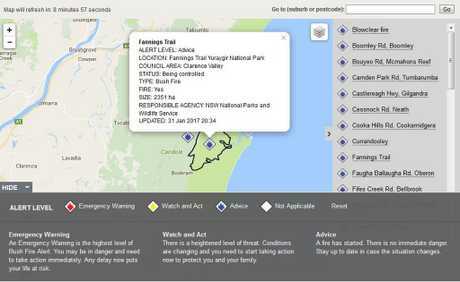 The bushfire at Fannings Trail in Yuraygir National Park, which was first reported on Sunday afternoon, had covered 1567ha when the NSW Rural Fire Service last updated its website at 1.15pm today. 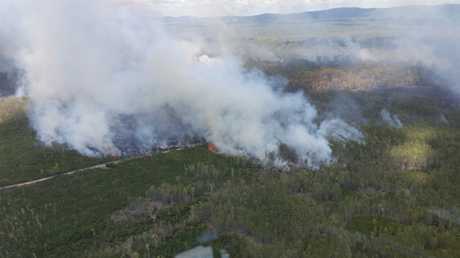 NSW Rural Fire Service Clarence District manager Superintendent Stuart Watts said containment lines were being established along the western and southern boundaries of the fire. "National Parks, RFS crews and state forest crews are working on containment along the southern part of the fire," Supt Watts said. "The Coast Range Rd on the western boundary and the Sandon River as the southern boundary. "Backburning operations have commenced in those areas, and will go into tonight and tomorrow. "It will produce large volumes of smoke and a glow in the night sky will be able to be seen from the village of Sandon and possibly from Brooms Head." The status of the fire remains in 'out of control' with intense heat and strong northeasterly winds continuing to fan the fire and hamper backburning efforts. "It means the crews can't burn as actively during the day time," Supt Watts said. "We will have to wait until the heat diminished a little bit." No property is in immediate danger and Supt Watts expects the fire to continue to be contained entirely to Yuraygir National Park and parts of the Candole State Forest. He said the fire is being treated as suspicious and investigations will be carried out in the location where the fire was first reported, as well as the smaller Powells Gap Rd fire in the adjacent Candole State Forest. Supt Watts said the fire was well established when crews first reached the fire ground on Monday morning. 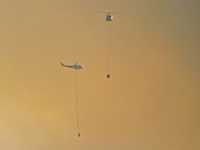 "By the time we could get ground crews in there on Monday morning the heat was picking up and the fire took a substantial run yesterday afternoon with the strong northeast wind." Smoke from Sandon bushfire: Vast quantities of smoke have filled the air to the south of the Fannings Trail bushfire near The Sandon on the Clarence Coast, as seen from Wooli Beach in this contributed video by Nikki Voss. TUESDAY, 10.30AM: A bushfire east of Grafton has burnt through a vast area of Yuraygir National Park and continues to burn out of control. According to the latest update on the NSW RFS Fires Near Me website at 8.54am, the fire had burnt through 450 hectares to the southwest of the coastal village of The Sandon. 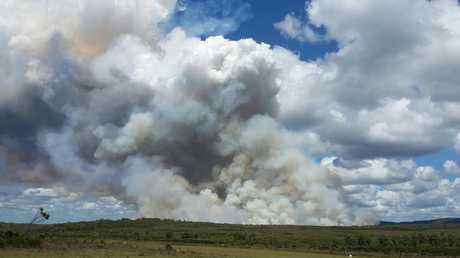 However, NSW Rural Fire Service Clarence Valley District officer Steve Ellem confirmed that figure is now up to 1020ha. Fire crews are working to contain the western front of the fire, which could be fanned by hot and strong north easterly winds this afternoon. 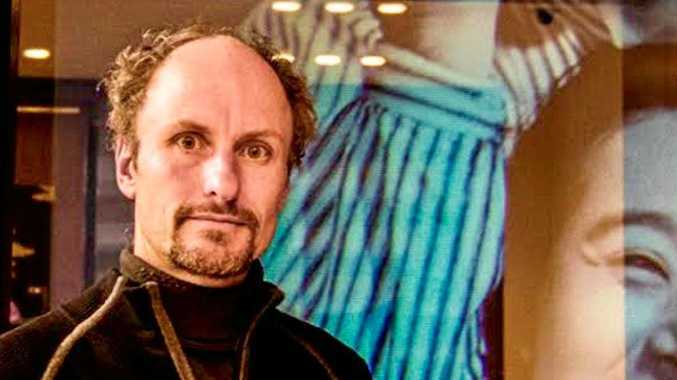 "At the moment the weather conditions look like putting pressure on the western containment line," Mr Ellem said. "We're looking at north to north east wind speeds from 20 to 30 kilometres per hour and picking up later in the afternoon. "National Parks are working on the western side of the fire, the RFS have a couple of crews assisting and we've got a couple of aircraft, firebombers in the air. We have a fair few resources on." While the fire is currently moving away from The Sandon, residents should be prepared to enact their bushfire survival plan. 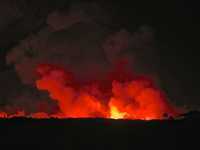 "At the moment we believe the southeastern side of the fire is looking pretty good," Mr Ellem said. "However, it's a good time for residents in the Sandon area to get familiar with their bushfire survival plan. "If the fire started moving to the east the village would be at threat of coming under ember attack." According to WeatherZone the forecast is for Yamba and the Clarence Coast is for a maximum temperature of 32 degrees today with northerly winds tending to the northeast and strengthening to 25kmh by 3pm. Further inland, Grafton is bracing for a maximum of 38 degrees for the next two days before a scorcher on Thursday, when the mercury is expected to peak at 40 degrees. TUESDAY, 8.30AM: Bushfire smoke has been reported 250km away as a blaze near Sandon on the Clarence Coast continues to burn out of control. 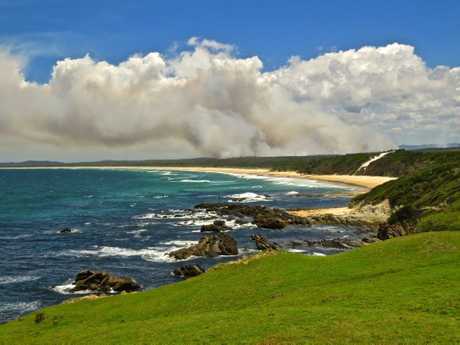 The Fannings Trail bushfire has now burnt 300 hectares of mostly heavily forested terrain in Yuraygir National Park. Fire authorities are continuing efforts to contain the Fannings Trail bushfire, as well as a smaller fire at Powells Gap Rd in Candole State Forest. "There has been quite a lot of smoke from this bushfire with reports of smoke as far down the coast as Port Macquarie," a NSW Rural Fire Service spokesperson said. 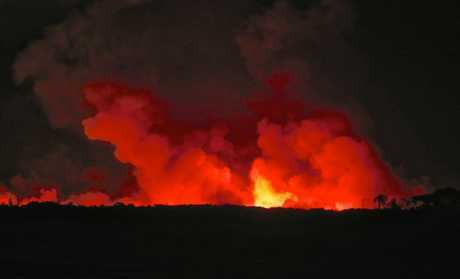 "It has burnt around 300 hectares and is not yet contained. However no property is under threat." The fire is under the jurisdiction of the National Parks and Wildlife Service who had 17 personnel activated at 8.30am this morning, and NSW RFS assisting with six firefighters and aircraft assisting with intelligence. 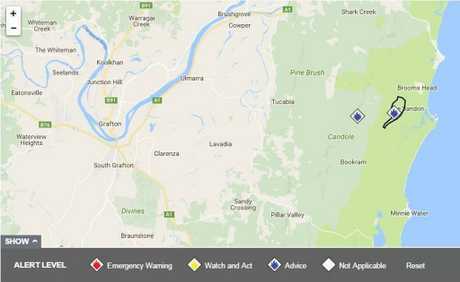 For updated information about the fires visit http://www.rfs.nsw.gov.au/fire-information/fires-near-me. 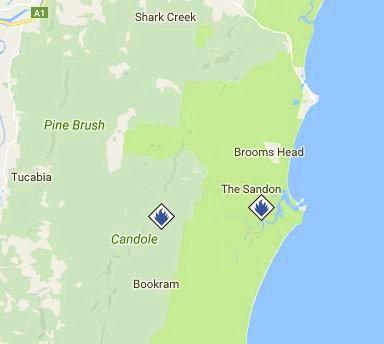 MONDAY: Two fires are currently burning to the south of Brooms Head sending smoke over the Lower Clarence. The fires, which are marked as out of control on the Rural Fire Service website, are at the Fannings Trail iand Powells Gap Road at Candole State Forest. The Fannings Trail fire is affecting 40ha, and is under the watch of NSW National Parks Service, and the Candole forest fire is 20ha in area, and is under the eye of Forest Corporation of NSW. Both fires are under the "Advice" category for fire warnings.